We're back with a new bread challenge. This time we stayed far from the wet side and instead looked at a master of bread baking for guidance. 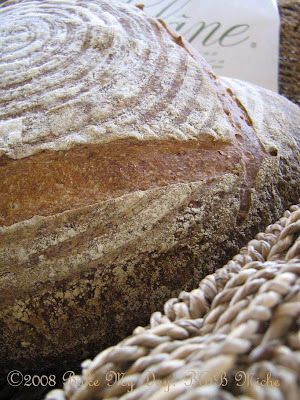 Our Kitchen of the Month Sher chose to bake a bread in the style of Poilâne; a Miche. The recipe for this bread can be found at our Kitchen as well as in one of the must-have books; Peter Reinhart's The Bread Baker's Apprentice. Although the recipe is long, and the terms Uncle Peter uses are quite confusing the bread itself is surprisingly easy to make. Since we have been building a starter for quite some time now, I chose to use Pumba as my "seed culture" to build into a "barm" with which to make a "firm starter". Yes. That's what I mean by confusing. In simpler words, what you do is use a part of a sourdough starter, make it firmer in two steps over a couple of days by adding flour. Simplifying: the seed culture is made like any other starter. Next step is making a "barm" by upping the flour while using less water to refresh. The firm starter is what it says: a very firm pre-dough made with a part of the barm. What I particularly loved about this bread is to see how powerful our starter has become. I must say I wasn't too sure of it's qualities to lift 7 cups of flour without any additional help from commercial yeast. It was capable of that! Not only lifting it in the first rise but again when shaped and still had enough oomph left to do a nice ovenspring! Furthermore, the final bread was delicious! It looked darn good, smelled fine and the flavour had all of the whole wheat nuttyness without being real sour, it was a little dense using all whole wheat but in a good way, surprisingly airy. My family dislikes a very sour bread and they raved about this one! I need to work some magic on the crust though, it was eeh...quite convincing. I really need to do a little Oscar speech here: I like to take the opportunity to thank Monique who again brought me some special flour! She went to Paris (well that's a minor point; all by herself, didn't even invite me! 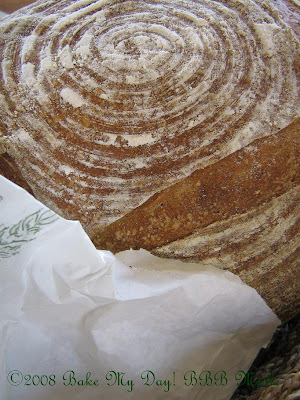 ), visited Poilâne and bought a bread and some flour to bring home! She even thought of buying some flour for me! Now if that isn't sweet I don't know what is! Cover loosely and let ferment for 6 hours on the counter, then store in the fridge overnight. This baby is going to rise, make sure it has got a lot of headspace! 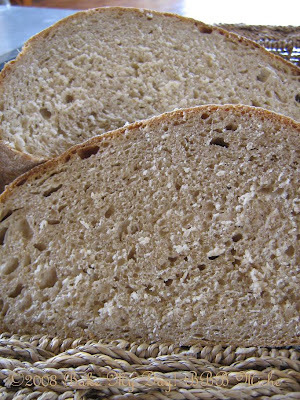 With this barm -and as you notice it makes quite the quantity- you have a powerful supply to bake a lot of breads with. The barm can be used for three days without feeding. (Store in the fridge and let come to room temperature before you use it). Feeding it is rather simple: Uncle Peter advises to always double, triple or even quadruple the barm when feeding to prevent a real sour barm. So, if you'd like to keep some handy, use some to bake with and feed the remaining barm with equal weight flour and water. If you have a lot of barm but haven't fed it for a while, discard all but 1 cup and refresh it with 4 cups of flour and 2-1/2 to 3 cups water, stirring until all the flour is hydrated. If you're not going to use the barm for a while, store it in the fridge or freezer in a tightly sealed container. Let it come to room temperature and refresh as above. This one is really firm, feeling like a real dough already, it needs to be kneaded for a little while to hydrate all the flour and ferment for 4 hours on the counter, overnight in the fridge. All of this firm starter is used to make the dough for your bread. Proceed to follow the original recipe. This recipe yields an enormous quantity of dough and your stand mixer is going to either struggle or die.... I followed Uncle Peters advice and kneaded it by hand which wasn't difficult at all. I decided to divide the doughball and make one larger boule and three small batards. I wanted to use my banneton for the boule and it wouldn't accomodate such large quantity of dough so that's why. 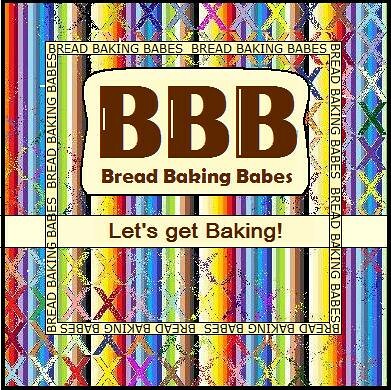 I do have some other information for you... this month again you can be our Bread Baking Buddy and earn a Badge! Due to the nature of this recipe, the use of the starter, barm, and firm starter we have expanded the days to bake to 14. So here’s how: You have until June 2nd to bake the bread and post about it on your blog with a link to the Kitchen of the Month’s post about the bread. E-mail the Kitchen of the Month with your name and a link to your post OR leave a comment on the Kitchen of the Month’s blog that you have baked the bread and a link back to your post. Kitchen of the Month will do a round-up of our Bread Baking Buddies at the end of the baking period and send you a BBB badge shortly after you notify her of baking the bread. No blog, No problem - just e-mail the Kitchen of the Month with a photo of the bread you baked and you’ll be included in the round-up. Same recipe, different kitchens, using local flour and sharing what we found. You can read all about our monthly recipe at the Kitchen of the Month, our individual posts to be found at our respective personal blogs, listed at the right hand side! Babes on Hiatus: Living on Bread and Water (Monique) Thyme for Cooking (Katie). I love your pictures. I must get one of those lovely bread proofing baskets. It makes the surface of the bread looks so elegant. I was surprised too at how the bread was easily powered by the starter. Great slide show Karen. Love your bread!!! It really is note worthy that any good starter could power this bread! I agree, Monique could have been a better friend and taken you with her to Paris! Flour and a Poilane bag was a stellar start! Secret ingredient indeed. Your bread is beautiful but I think like Ilva said I've told you that before! Oh my goodness! Your bread looks beautiful with the banneton rings on it. It looks perfect! Wish I could make those same bread designs! Great job and interesting take on the recipe. Glad to have your thoughts. Great job! @Ulrike: Well since I have the book I used the ounces P.Reinhart states there. For the starter however it's not a "weighty" subject to use cups. Great looking bread! You must have had a proper basket for it...as well as the lovely flour! Lucky you! I want a taste!!!! Your bread looks so good! Pumba is awesome, lifting that heavy loaf all by itself. I agree with you, the words are the most difficult part about making this bread. You used the basket and your bread looks so professional! Monique - in Paris - alone!! But she did return with some nice goodies! Very impressed! It looks really beautiful. I love the rings created by your banneton. Wow! Your loaf is so gorgeous! Love all your pics. Just beautiful! @ejm: Oops sorry! I eyeball the toss off. Usually I am very meticulous and weigh everything (preferrably in metric) but with the starters I find that they thrive anyhow. So what I do is stir, look at the starter and see how far it is up the sides of the container, keep that line in mind and slowly pour off until it's halfway up there. Then feed it. The crust however has a sour tang to it, and it does smell like it too. Strangely enough it doesn't taste like it. This being said I think it all depends on the starter, maybe mine is less sour due to my "feeding habits" or local circumstances? Anyway there is only a small portion in it as you use lots of flour to make the bread. Your bread looks amazing! I saw it in the Reinhart book and contemplated making it too because it looked great. Yours looks just like the picture! That's one beautiful loaf, you've done Poilâne proud! My husband loathes sour bread as well. That's encouraging to hear that your husband didn't know that the bread was sourdough. My starter is really a small amount so left-overs are tiny. Can you give a rough guess as to how much sludge you start with? Or is it likely that the building up of the starter to make the "barm" would work with just a couple of tablespoons? The best way to honour me and my Poilâne flour and bag is to bake such a fantastic bread out of it, Karen ! And Sue and Tanna, do I hear some jealousy here? Meat me in Paris and we'll fight it out ! Hi Elizabeth, I just stirred and weighed my toss and it's 5 oz or 140 grams (approx. 2/3 cup). This is what I used, fed it with 1 cup flour and 1/2 cup water for 2 days, tossing half off inbetween then build it into the barm. I assume all of you have seen this? Thank you for weighing your tossoff. I'll keep it in mind and maybe at some point (if it EVER gets warm in our kitchen) I'll have the courage to try this. I really do appreciate that you have translated a large part of the recipe into layterms. Okay. That's it. This is the month where I have to get my act together and become a BBB!!! It just turned out wonderfull and made an beautifull loaf with a nice taste. Can't hardly wait how the Polaine will taste. Nice looking loaf! I really want a banneton (or 2) - it's on the wish list! Good work.